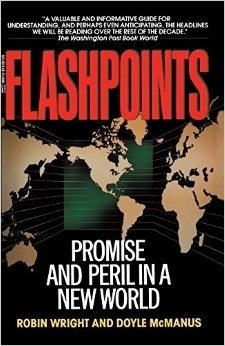 Robin Wright and Doyle McManus, two Washington-based reporters for this newspaper, announce in the first chapter of Flashpoints that we are presently living through a major turning point in world history, one of such fundamental importance that "almost five hundred years have passed since mankind experienced anything comparable." Five hundred years is a long time. Since 1491, the world has experienced the Reformation, the Enlightenment, the French Revolution, Industrial Revolution, imperialism, World War I, the Russian Revolution, and World War II. Are these really less important than the events of the past year or two? That's a big claim to make, but it's the assumption that underlies Flashpoints. "Economic power has become more important than military power." "Territorial expansion and empire-building have become irrelevant, at best." "Every political system in the world . . . faced a common crisis in the 1990s: the crisis of legitimacy." The left-to-right political spectrum has disintegrated; new leaders are less ideological and ideology will have a very limited role in future conflicts. The most worrisome tendency in the world today is that the Cold War allies will "move apart unintentionally." New ideas come from the masses, not from leaders. The power of the individual is greater than ever before. These many shifts together add up to what Wright and McManus call a "new idea of order" in the world. The authors do not name this order, but they say that paradox, along with complexity, is its dominant characteristic. Not surprisingly, their own attempts to define the new idea are also pretty paradoxical and complex. Here's one attempt: "In an era of diffused and devolving power, its cornerstone is not dominance but global pluralism. Its major aims are empowerment and accountability - both within and among societies." And these changes will be felt everywhere, for we now live in the "first truly global phase in the first truly global age." In case you think this sounds rosy, don't. "Burgeoning disorder," Wright and McManus note, characterizes our age of troubled transition. Unemployment, disease, malnutrition, and crime threaten to undo the achievements of the 20th century. Terrorism is "almost certain" to escalate for years to come; absent settlement of the Arab-Israeli conflict, fundamentalist Islam and Judaism seem "certain" to grow; AIDS will traumatize the next two generations. The book's subtitle tells of promise and peril, but a phrase in the book summarizes its contents more accurately: "A new crisis every day." Whew. It's enough to make a reader scared to get out of bed. Given how well things seem to have gone of late, though, this alarmism is a bit odd. The darkest forces of the 20th Century - fascism and communism - are in abeyance. World War III never seemed less likely. Democracy is spreading. Despite a widespread impression to the contrary, the global economy is growing. Why, then, so one-sided a focus on problems and a pervasive sense of lurking calamity? Because the authors lack a grounding in history. Their dismal scheme ignores the proven flexibility of institutions, the inventiveness of the human mind, and the durability of nature. They draw alarmist predictions because, like the Reverend Malthus and the Club of Rome, they blindly extrapolate. It may be that AIDS will infect tens and tens of millions, as they predict; but chances are pretty good that something will happen along the way to render this prediction overly pessimistic. Worse, the authors make a specialty of extrapolating major conclusions from the merest wisps of evidence. Here are two examples. Fact: extremist groups are gaining strength in Germany (the National Alternative), France (Le Pen), and the United States (David Duke). Trend: Fringe movements are gaining at the expense of the mainstream. But extremist groups ebb and flow all the time; who knows if this gain is long term? The evidence simply is lacking. Similarly, the observation that Democratic Socialism might be making a comeback appears to be based on a surprise victory for Socialists in Ontario Province, Canada. The study of history teaches the danger of glib extrapolations such as these. It also teaches facts. On the macro level, Wright and McManus wrongly assert that the nation-state has been the principal power structure of the last 500 years (empires have been) and that power is "more widely diffused than ever before" (American preeminence today is strikingly anomalous). On the micro level, Uighurs do not use Arabic script and the Jordanian election of 1989 was the first open vote in 32, not 22 years. The authors seem to have had a fundamentally flawed research plan for Flashpoints. Traveling six continents and interviewing hundreds means, in effect, that they rushed around the globe recording the banalities of taxi drivers and politicians. (The clownish foreign minister of Italy, Gianni de Michelis, for example, inveighs against what he calls Newtonian democracy, which is based on a mechanistic understanding of society, and calls for a democracy "based on systems theory, interaction and flexible feedback - with no fixed flow of information and power"). Hoping to take the pulse of the planet, they instead embalm reigning globaloney. Wright and McManus are clearly very intelligent. Their book might have been a coherent, original analysis had they spent less time on the road, more in the library and in their offices. An in-depth study of history would have provided a context for current events. With more knowledge of the big picture, the authors would have been less prone to the irritating first-time-evers and more-than-at-any-time-in-histories. More thought might have reduced the book's internal inconsistencies. We learn on page 54, for example, that ideology will be replaced by ethnic, national, and religious forces; then we read on page 160 that economic misery is likely to replace ideology as the leading cause of indiscriminate violence. Which is it? Wright and McManus never should have written on this topic; they are out of their depth. A historian would likely do badly covering news conferences, interviewing reluctant sources, typing out analyses in hotel rooms and writing on deadline. So a journalist has the wrong temperament to devote sustained attention to a large and abstract issue. (And two of them working on one book compounds the problem.) Robin Wright showed the potential of journalistic history in her fine and reliable book, In the Name of God, a study of the Khomeini decade in Iran; but the overly ambitious Flashpoints demonstrates how even talented journalists can bomb. Apr. 20, 2009 update: I met Doyle McManus, one of the co-authors, today, almost 18 years after Flashpoints appeared. I expected to be berated but to my surprise was told that my review got the book right and was the only review to do so.